Over 20 years ago (1 day counts as "over," right?) Sony released the original PlayStation console and changed the face of gaming. Thanks in part to Jurassic Park. On October 28th, 1993, we held what was to be the first PlayStation tech presentation at the Sony HQ auditorium. Be brought altogether 4 test machines. These were prototype models that had not yet undergone large-scale integration where the basic functions were enabled by connecting numerous electronic parts and housed in duralumin racks. After giving an brief explanation of the tech, we moved the audience to the 4 demo machines that were set up on either side of the stage. As crowds of people gathered around, we began the tech demo. First, a white circle, triangle, and square appeared on the screen. By using the controller, we showed by moving the camera around that these weren't flat images, but really a 3D rendered sphere, cone, and cube. After that, we added colorful light sources in the screen to show a demo of shading. Next, we showed multiple 3D objects on the screen at once to show off the powerful rendering capabilities. 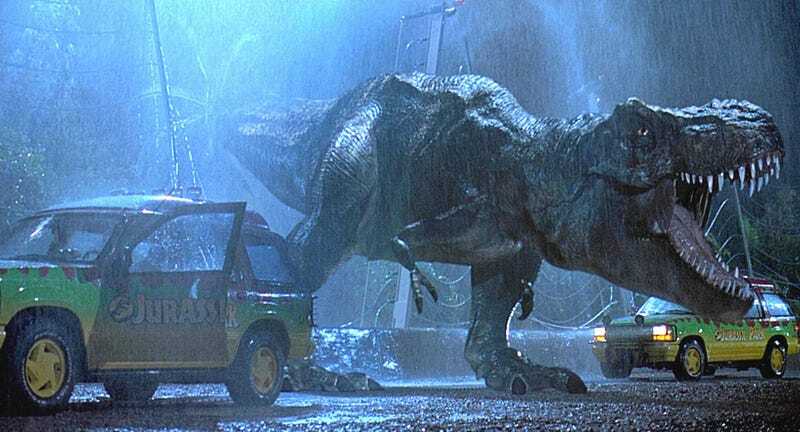 Finally, we showed a 3D image of a tyrannosaurus rex like the one from the movie Jurassic Park that had opened the same year. It wasn't a basic polygon 3D image, but a realistic image with minute details in the dinosaur's skin. Then, by using the controller, we began moving the dinosaur in realtime. The dinosaur suddenly began moving forward, roaring and moving its eyes as the software makers simply stood there and watched in silence. It was the same at the other demo machines. In such a manner, the presentation came to a close. After the last guest had left, we looked at each other nervously wondering "how did it go?" The demo itself went well – in fact you could say it was almost perfect. But maybe it wasn't very impressive to the audience... We had been expecting a more emotional response and instead, it was as though we had been blown off. However, as I heard later, apparently, everyone had been so overwhelmed that they couldn't say anything. From the next day, we got a response that far surpassed our expectations. Our dream began moving towards a reality. In a separate interview Sony Worldwide Studio top man, Shuhei Yoshida recalls his first memories working with Kutaragi on the original PlayStation. "Mr. Kutaragi said that he wanted to make a machine as powerful as the Silicon Graphics Onyx – a machine that at the time cost over 10 million yen (US$833,848.36) – and sell it for '50,000 yen' (US$416.91). I thought to myself, 'this man is a liar.'" Kutaragi has since left Sony after developing the PlayStation 2 and 3. Yoshida still remains at Sony, though through his own admittance, would have thought about retiring if it hadn't been for Project Morpheus, Sony's interactive 3D head-mounted display. "On a personal note, I turned 50 this year. When you reach your 50's all of a sudden you begin to see down the road ahead and I began to think about retiring and considered finding a successor." Yoshida said with a laugh. "However, once I got involved with the development of the Project Morpheus system, it felt much like what it was like before the release of the original PlayStation, and I began thinking, 'how cool would it be if this technology became available to everyone.'" Looks like Yoshida's going to stick around a little longer. The past 20 years for the PlayStation has been the evolution from CG rendered T-rexes to virtual reality headsets. Here's to the next 20 years.